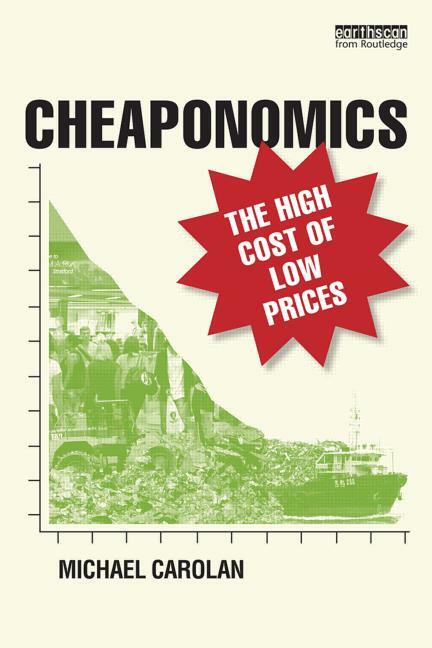 The author captures these issues by the concept of “cheaponomics”. The key point is that costs and risks are socialised: we all pay for cheapness, but not at the point of purchase. Drawing on a wide range of examples and issues from over-consumption and waste to over-work, unemployment, inequality, and the depersonalising of communities, it is convincingly shown that cheapness can no longer be seen as such a bargain. Instead we need to refocus for a better sense of well-being, social justice and a balanced approach to prosperity. This entry was posted in Campaigns and tagged Cheaponomics, Michael Carolan, The High Price of Low Cost by tamesidegreens. Bookmark the permalink. How refreshing; exactly the kind of information we need to spread around.